In order to enjoy every aspect of the camping trip, it’s essential that you are properly energized all the time. That is why having quality sleeps and rests is extremely important. A sleeping bag would have been sufficient but if you wish for extra cushion, you could always count on an air mattress. However, there is a lot of brand and model on the market that can make you feel lost. In that case, this article will be helpful. You shall find a selected list of excellent examples down below. 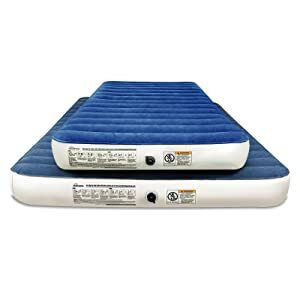 Through them, you may obtain the best air mattress for camping. Everyone got their own needs and requirements so it’s best that you don’t make the purchase base on words alone. If you just rush out to buy a product without careful consideration, you may waste a lot of money for little gain. Crosscheck your preferences with the product specification and see if it can fully satisfy you. You are the one that going to use it so get something that is both practical and usable. That is how you can ensure your investment is well-spent money. Keep that in mind while you are examining the characteristics and measurements of the products. This is the thing that can make you feel just like your bed at home thanks to its comfort and size. 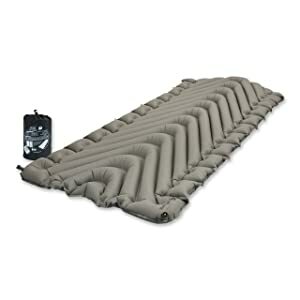 SoundAsleep Camping Series Air Mattress is a great product with high endurance and convenient height. Its fabric material is fairly durable, waterproof and can withstand rough operations. You can quickly lie down and get up relative easy which is not common in its price range. The high capacity internal pump is a nice feature since it means you don’t have to carry around a separate pump. All it takes is 4 minutes for the pump to fully inflate the mattress. Built with 40 air coil across its body, this product is appreciated by campers with back problems and joint pains. If you toss yourself inside the tent regretting that you should have used something better, you can’t go wrong with this one. It comes with its own container for transport so you can carry the mattress with ease. After a tedious camping day, you can hardly expect anything better to lay your body on. There are several minor downsides though such as the noise of its pump and can’t be used with a standard sheet. MondoKing is a robust and basic design but it got one of thickest padding available. The well arranged foam core inside allow you to enjoy softness on every inch of its surface. The padding is also excelled at insulating your body from the ground so temperature change is not a big issue. Its fabric durability is quite high with admirable resistance against tear and wear. If you are looking forward to enjoying a bit of luxury while camping, the MondoKing should be on your shopping list. You may feel that the price tag is a bit on the expensive side though. It’s self – inflating so there is no need to bring a pump along to prepare the mat. All you have to do is a couple minute to set it up and the mat should be ready. The dimension is not exactly small though even in the packed form and rather heavy. But if your primary concern is comfortable then this product won’t disappoint you. Its quality and usefulness are definitely worth your time to check it out. 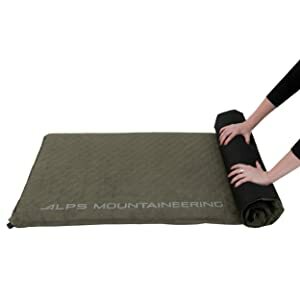 At an affordable price, Comfort Air Pad from ALPS is a pretty decent air mattress for a comfortable camping trip. With high strength polyester fabric and soft blending foam, it’s an economical and effective product. It will keep you warm and take care of your worn out body so you can wake up completely rested. One innovative feature of this design is that the bottom side is litter with plastic dots. This should prevent the mat from sliding all over the place in the middle of the night. Couple with the suede finish on top to secure your sleeping bag, your experiences with the product would be uneventful and enjoyable ones. Comfort Air Pad may seem to be a bit thin to some peoples, especially for side sleepers. 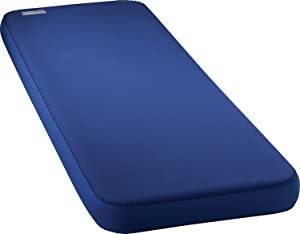 It’s quite soft however so for infrequent user or back sleepers, the product should be adequate in most of the case. The mat is also self-inflated which mean you can leave your pump at home. If you just want something basic and functional, this is everything you need for a good night sleep. For occasional campers, Exped MegaMat 10 is a good product given that it’s easy to use and quite tough. With nearly 4 inches worth of foam and air pad, it can give you some quality resting time after a long day. As a result of effective insulating construction, you should feel pretty warm no matter how cold the camping ground is. The use of laminated polyester fabric ensures the mat body is fairly resistance toward humidity, wear and tear. The efficient air channels within the foam keep the weight down but retain excellent softness and comfort. Exped MegaMat 10 can be adjusted through the intake valve so you can get the mat to an ideal dimension. It got a built-in flap to stop the air from escaping while you inflate the mat. The flap can be manually handled to let the air out. Thanks to the well-done seams, the mat body is airtight and would stay that way for a long time. One of its shortcomings is that it’s called a self – inflating mat yet you have to use an included mini pump to inflate it. It’s much more expensive than other product in the same category as well. If you have space to spare and want something that keeps you off the ground, Coleman Airbed Cot – Queen shall serve you well. Its sturdy and reliable stance elevates the mat and separates it entirely from the surface. This is greatly appreciated by people with knee issues that have a hard time getting off the bed in the morning. There is no contact between the bed and the surrounding environment so cuts and leaks are minimized. It also comes with side trays for you to put small items such as smartphone, clock, book, etc. Temperature can more or less affect the performance of an air mattress since it’s filled with air. 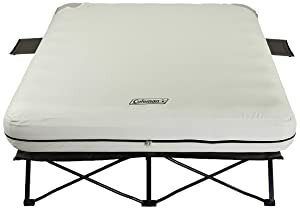 So if you intend to go on a camping in chilly weather, Coleman Airbed Cot – Queen is the perfect companion. It eliminates all contact with the cold or even frozen ground and let you stay toasty warm. The stance is kind of troublesome to transport over long distance though. Once in awhile, you have to pump the mat and refill it for regular uses. With an interesting appearance, Klymit Static V Luxe is the product highly sought after by minimalist. Its V-shaped air channels enhance the user comfort and keep the mat relatively light. The side rails underneath held the Luxe in place so sliding is not an issue. When packed, the mat is extremely compact though it comes with a certain loss of insulation and structural support. You should only use it for summer camping due to the barely acceptable insulation.